PAUL CAIN RAN THE RACE AND FINISHED WELL! 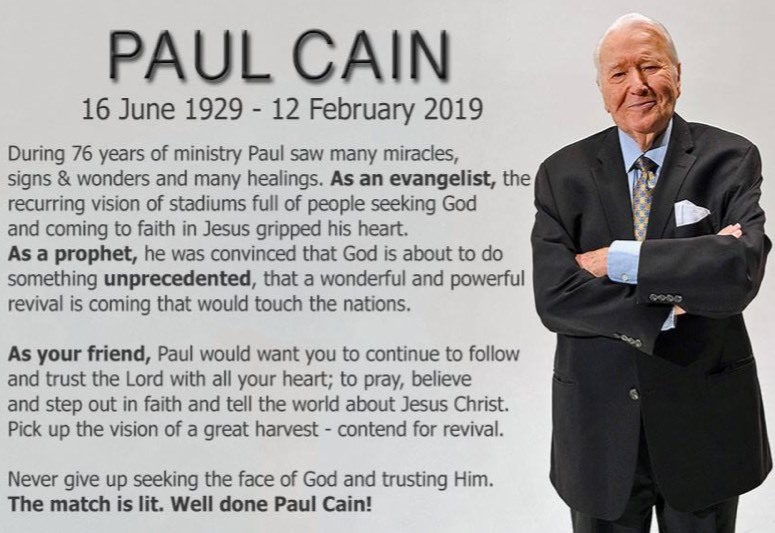 ON 12 FEBRUARY 2019, OUR PRECIOUS FRIEND BROTHER PAUL CAIN WENT TO BE WITH THE LORD JESUS CHRIST. HE LIVED HIS LIFE FOR, AND TO THE GLORY OF GOD. HE WAS THE FRIEND OF FRIENDS TO THOSE IN LOWLY POSITIONS AND TO WORLD LEADERS AND OFFICIALS. HE LOVED THE LORD, AND THE LORD WAS TRULY THE MAGNIFICENT OBSESSION OF HIS HEART. You are going to see some things that will leave some of you without words for days! There is a resurgence of the fear of the Lord coming – and it will fall suddenly, unexpectedly, and unannounced. A new day is coming! It is not an encore – this will be like no other. This will be a hallmark of a huge wave of the Spirit that will sweep around the earth. It will be about holiness and purity of heart – and it is a waste of time telling folks to get ready. It will just come – SUDDENLY. Paul Cain was a Pentecostal Christian minister involved with both neo-charismatic churches and the Charismatic Movement. In his early ministry life, Cain drew crowds of 30,000 in Switzerland and Germany with his meetings. Cain’s ministry at this time used a very large tent, like most other ministers’ of the time, such as Billy Graham, Oral Roberts and Jack Coe. He traveled around the world, proclaiming the Gospel and ministered to many national and international leaders.